Apple Music is a popular streaming music service developed by Apple Inc, with impressive 40 million subscribers as of April 2018. It offers three types of subscription - $9.99 per for individual, $14.99 for family (up to 6 members) and $4.99 for students. New subscribers can get a three-month free trial period before paying the service. After the free trial, users can discontinue the subscription to prevent from being charged or keep it by paying subscription fee. A great many people wonder whether they can keep the Apple songs they listened to after the three month free trial. Here comes the bad news: You will lose all access to the songs on Apple Music if you discontinue the subscription after the free trial ends. But the good news is that in this article, you will learn a special way to keep them forever even if you cancel the subscription after free trial. To get Apple Music free forever, we’ll have to download and stream the songs from Apple Music to our local computer. But as we all know, all the songs on Apple Music are protected in DRM. We are not able to listen to Apple songs without iTunes or the App, not to mention to get songs downloaded from Apple Music as local files. All in all, it’s the DRM that stops us saving songs from Apple Music to computer. As long as we can get rid of the DRM, we can easily stream and download any songs from Apple Music to our local computer. NoteBurner iTunes DRM Audio Converter is a powerful DRM removal tool, which is able to kill the DRM in Apple Music, audiobooks as well as iTunes M4P music and convert them to a popular format (MP3/ AAC/ WAV/ FLAC) at up to 20X conversion speed with lossless output quality. NoteBurner iTunes DRM Audio Converter is a user-friendly program. We will be able to get Apple Music as local files within 3 simple steps. Before we get started, please have NoteBurner correctly installed on your computer. Launch the program. Click "+" button on the upper left. A pop-up window will show you all your downloaded Apple Music in iTunes. Select the Apple Music you like for converting. Click the "Settings" button on the upper right of the interface, where you are able to choose output format ( MP3, FLAC, AAC or WAV ), output quality, conversion speed, as well as output path. Click “Convert” button. When the conversion is done, all the Apple songs you chose in Step 1 would have been downloaded and saved to the output folder you set in previous step. By clicking "Menu" button on the upper right of NoteBurner iTunes DRM Audio Converter or directly going to the output folder you set in Step 2, you can find all the downloaded Apple Music on your computer. 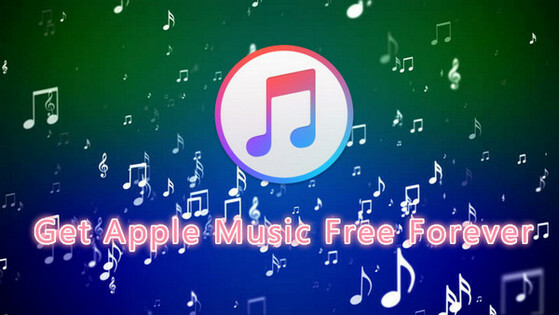 Now you’ve got DRM-free Apple Music songs on our local computer, you can play them whenever and however you like, which perfectly meets your need to get Apple Music free forever. Note: The free trial version of NoteBurner iTunes DRM Audio Converter converts three minutes of each audio file only. If you want to unlock the time limitation, please purchase the full version of NoteBurner iTunes DRM Audio Converter with $39.95.